செய்த சிறிய குற்றத்திற்காக, தன் தந்தையால் அடித்து மோட்டார் சைக்கிளில் நிர்வாணமாக கட்டியிருக்கப்பட்டான் இந்த 12 வயது சிறுவன். In many cases, the methods of organizing children in many cultures were severe. Unfortunately, the present parents realize that moral morals can affect the mental health of children. Even some parents use the penal method. In China, this 12-year-old boy was naked on a motorcycle by his father for a small crime. This horrific event is widespread on the Internet. In the video, you can see that the boy’s body was wounded by the stroke. Faced with the passengers, the beaten boy asked his father to be his real son. 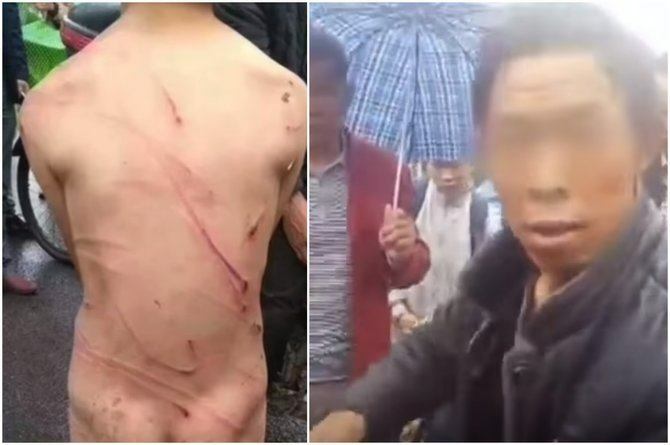 The reports of Yunnan C reports made by the authorities claiming that the boy would be forced to pay off his father every day because of the irresponsible anger and frequent trauma of the stolen son. Mother is earning vegetable sales. According to the South China Morning Post, he has seen 100 yuan coins under the bed. Reports say that he is running away from home. However, the boy pushed the jacket and asked him not to interfere in the meeting. His father left the place. Although he does not know whether he or she has done good intent to organize his son, his brutal acts are unforgivable. This young boy will have psychological scars during the growing season. Father to protect it, the fear of this young child and the reason for humiliation is a little embarrassing. கொடூரம்!மும்பை பள்ளியில் 4 வயது சிறுமி பாலியல் பலாத்காரம் செய்யப்பட்டாள் !